We have a number of maps for the camp. Which map you require will depend on your activity. There are numerous hiking opportunities in and around Camp Nemo. Within the camp there is the yellow perimiter trail and many interconnected trails. Do you know where the corner stone is? How about the old rusty piece of farm equipment? 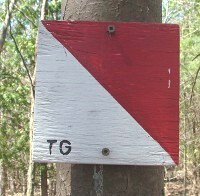 Have you found all the orienteering markers?The trails within the camp are marked with electrical tape. Look for the rings of coloured tape on trees to follow any given trail. Double rings of the same colour tape denote a sharp turn in the trail. Note that the powder blue on the map is actually the white trail. If you have any problems with the trails such as fallen trees or hard to follow sections, medicine please let us know and we will attend to the problem as soon as is possible. We have GPS units available for use by visitors wishing to use the course. The object is to find the control points and record the letters that will be found on these points. The course is setup in two sections. Control points 1-12 are for beginners (cubs, pill junior scouts) and control points 13-32 are for more advanced hikers (senior Scouts, Venturers). The junior course should take about 30 minutes, the senior about 2 hours.